Time to Spring Clean! We were out of town last week so I’m planning to get a lot done in the coming weeks now – especially since it’s a bit warmer now too. 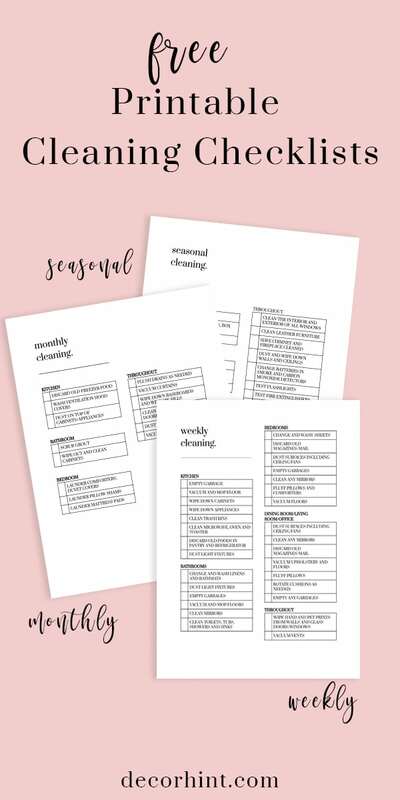 I want to share with you some of my favorite homemade cleaning solutions as well as some (free) printable cleaning checklists to help you stay the course. These cleaning checklists will help to keep you on track weekly, monthly and seasonally. I will be the first to admit that I don’t always have time to make my own cleaning solutions. However, for the times I do, I love whipping up a batch of this diy all purpose spray. It literally costs pennies to throw together and more importantly – it works like a charm! This spray uses just a handful of simple ingredients that you already have in your house. I know there are a TON of homemade cleaning recipes out there, but I wanted to share what works for me too. Basically, you just need Water, Rubbing Alcohol and Dish Soap. Or really just Water and Dish Soap for a simple all purpose spray. I don’t believe that we need to be constantly disinfecting everything. I’m partial to the Dr. Bronner’s Castile Soap. It smells sooo good and I love that it’s all natural. You can also add vinegar but vinegar is not safe for granite or marble countertops and it can ruin the finish on some hardwood floors (I’ve heard – haven’t experienced that myself). I have two littles at home – one is school age – so we have our fair share of germs. When they are sick – I’m all about killing those nasty germs and bugs around the house! When they are not, I think this simple all purpose spray really does the trick when cleaning. The dish soap is neutral and safe to use on all surfaces. When I want to disinfect, it’s easy enough to add in the rubbing alcohol. Also – it’s important to note – if you are using essential oils, it’s best to use a glass spray container (such as this one). Essential oils can break down the plastic in a plastic spray bottle (again – so I’ve heard.) Just wanted to throw that tip out there though! I don’t think I have bought actual window cleaner in a long time. This simple cleaner has been working for me. I keep a small batch of it in each of the bathrooms along with a microfiber cloth. Mirrors are clean and sparkling after each use! I also have to give you this magic stain remover! I’ll give you a little story about how I fell in love with this recipe. Soooo, we left our outdoor furniture cushions outside all winter – uncovered – exposed to the elements. Surprisingly it wasn’t the rain and weather that almost destroyed our cushions – it was a bird. Yes. One bird. That was making a nest and pulling all kinds of debris and nasty stuff out of our gutters. And dropping a bunch of it repeatedly onto our cushions. I didn’t have the heart to stop him or her. But I silently wept inside with each drop of debris. We have nice white cushions and after the bird incident – they were white and brown and black stained cushions. Anyways – on a nice sunny day here – I decided to try and tackle the mess with dish soap and water. And nope. It cleaned them but didn’t budge the stains. Then I remembered about hydrogen peroxide being good for stains. And what do you know – took the stains right out. Cushions look like new again. **I tested a small section before using it on the whole cushion – just to make sure it wasn’t going to do any permanent damage. I would suggest you do that as well just in case. All of my printables are located in my free printable library for subscribers. 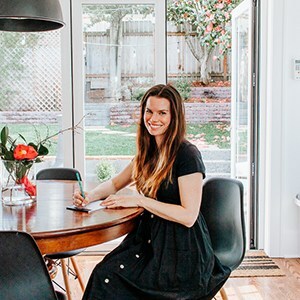 To get access to the free printable library, just enter your email address HERE or below this post to subscribe to my email newsletter and you’ll be sent the password. The library includes printable gift wrap, meal planners, daily planners, project planners, to do lists, wall art and more! What are your favorite homemade cleaning recipes? I’m always looking for new ones and want to compile a list for you guys- so let me know!